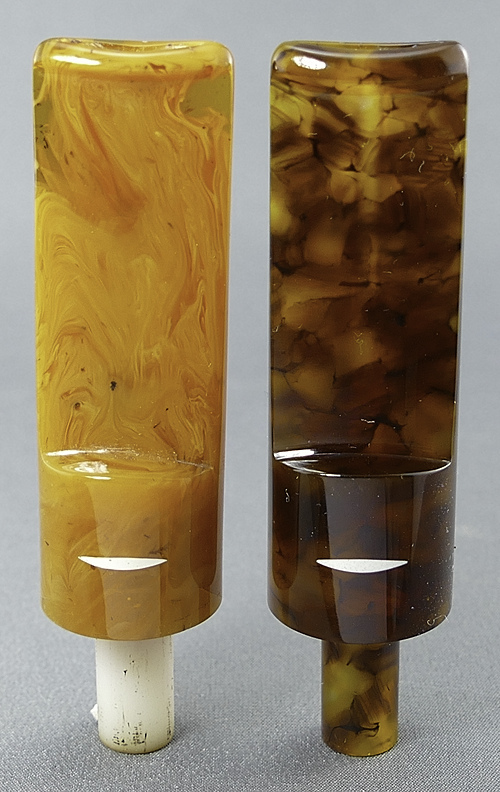 Since I didn't have access to the original acrylic stem stock (I'm fairly certain it is something Baldo casts himself), the owner decided to go with Tortuga tortoise shell for #2. It's a bit darker, but very richly figured, and looks like something Baldo might have used himself if he'd made the pipe on a different day. Because of the previous tenon breakage problems---it's a large and fairly heavy pipe---I thought it best to reinforce the new one with SS tubing. Turned out well, I think. George, I think your customer is going to be VERY HAPPY! The pipe itself, that wavy rim is a lovely detail! Very nice work and the color selection is very tasteful. Dare I say I prefer the newer stem colour? Amazing work as always George. This pipe looks great with the new stem. I think Baldo Baldi himself would very happy. The new stem appears to be perfection itself, and is, to my eye, an improvement over the original. And, the logo looks perfect, and I know how hard (though deceptive) that one is. The only thing I can find any fault at all with is that it's not mine. Great job on the re-stem George. The new colour is a big improvement over the original in my opinion. Well done. georged, amazing. I own a Baldo and agree with your write up. They are a must own pipe. Although I don't have any Baldi's, I'd like to some day. Awesome job with matching the shape and logo. I'd be real happy to add this one to my collection. I've heard his stems typically could stand to be opened some, but it's hard to tell from the pics if that was the case with this pipe's original stem. Outstanding work as always but you understand how p****d I am at you right? Are you talking about my mistakenly putting that $60K bet of yours on the Mets because I fat-fingered the code on that Vegas website? Hey, it coulda happened to anybody. I said I was sorry, man, what more do you want from me? OK... Dan didn't try to bet $60K on the Royals through me. I made that up. It was $100K, and he accidentally donated it to a GoFundMe project in Guatamala. As for why he was pissed, he's the KC club's insanely hardworking & prolific newsletter editor---it averages 40+ pages a month---and would appreciate it if I'd send him repair project summaries and photo sets once in a while. Which, since I'm a club member, is a fair gripe. Dan? I'll do better for ya from here on out, OK? Pinkie promise. I prefer the new color and like the look of the sturdier stem. Good work! I love tortoise shell items (sunglasses, etc. ), so the new stem floats my boat. I'm fascinated by your ability to recreate random stem logos. George, as with the other replacement stems I've seen you post, this one is superior to the original. The lines are sharper and the shaping is more accurate (especially the line of the saddle, which looks to be at a slight angle on the original). It looks like perfect execution of what was intended, and the internals appear to be top quality. If I owned this pipe I would be extremely pleased with the stem you created, and it would affect positively my enjoyment of the pipe. It isn't really the topic of this thread, but I can't help commenting that I don't understand the high prices of Baldi pipes in today's market. I only have one, and it is clumsily shaped, heavy, and has a restricted draw. Generally when I look at other Baldis they also appear to be relatively unsophisticated in their shaping, but often selling at prices where you would expect extremely fine and detailed shaping and finishing. Perhaps I'm missing something and, George, with your eye and experience, I'd be interested in your opinion. But disregard this if you prefer not to sidetrack the thread away from stem manufacture and onto the merits of the pipe. I'm a HUGE fan of Baldis smooth pipes. Brilliant job on that one!! I am not sure about his pipes exactly, but the highest quality briar (growth rate, age, visible grain, block size, sound, defects) is very expensive. I own two BB's. If it were not such a sin ; they are to kill for . Yes, you do! As did everyone else. Great work. Thanks for taking the time to post. That stem is awesome. Outstanding job, George! Love that new stem and prefer the tortoise over the original. How are Baldo Baldi pipes? New stem very good, old stem bad. Excellent! 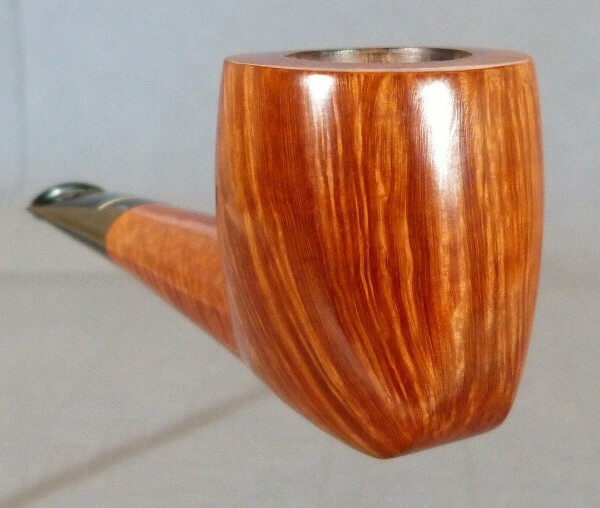 I had a P-lip style hyper-oxidized Vulcanite stem on a freehand estate pipe replaced with a tortoise shell fishtail stem and it made a whole new pipe with a West Germany stamp. It was a whole new day. Welcome to Internet forums, where old threads eventually become new again. As before, thanks for the kind words, gents. That was a fun one. Wow !!! Very nice ! I love the tortoise pipe stem. Is there a source for those or only through a guy like george? 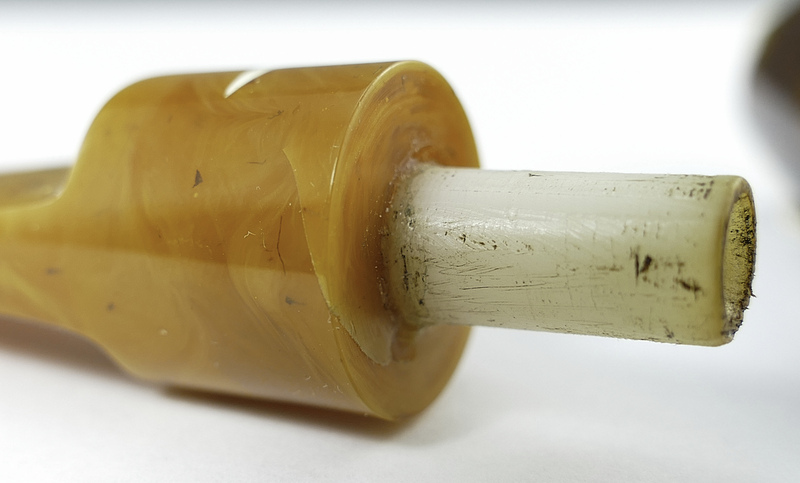 Dunhill once offered tortoise as its super-duper-extra-ultra-luxury stem option, many times more expensive than even ivory or amber, never mind "common" materials like horn or ebonite, but it has been illegal to harvest, trade in, or anything else for a long time. As in, get-visited-by-guys-with-guns-if-you-try illegal. As for me being a source for the material, I'm not. I just fabricate it. The supplies I use come (mostly) from either Steve Norse or Tim West.